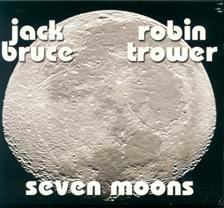 George Graham Reviews Jack Bruce and Robin Trower's "Seven Moons"
These days, it seems that in the business or media world a spade is never called a spade. There are a lot of euphemisms around. Take for example the term "classic rock." What at one time might have been considered an oxymoron now has come to mean the incessant repetition of a few dozen decades-old rock tracks by the commercial media -- tunes that, for the most part, were not really that interesting or creative to begin with. Given that connotation that the phrase has come to have, it's going to be tough for me to avoid using the term in considering this week's CD -- it's a fine new recording by a couple of British rockers were a prominent part of the seminal British rock and blues scene in the 1960s: Jack Bruce and Robin Trower have just released a new joint recording called Seven Moons and it represents the best that literally classic-style rock represents, but in the 21st Century. The Scottish-born Jack Bruce was the bass player in the band Cream, said to be the first of the rock "super bands," made up of well-known players from other groups, in their case, Eric Clapton and drummer Ginger Baker. Before Cream, back in 1962 Bruce played in Alexis Korner's Blues Inc., whose drummer was Charlie Watts, later to join the Rolling Stones. Bruce was also in an early band with guitarist John McLaughlin. Bruce was Cream's instantly-recognizable lead vocalist, and also wrote a lot of their material, including one of the world's best-known rock guitar riffs in The Sunshine of Your Love. Since Cream, Bruce has had an interesting and varied career including projects in jazz, fusion and even classical. Robin Trower was the founding guitarist in the band Procol Harum, known for their classically tinged tunes, including White Shade of Pale. Trower has been leading his own Jimi-Hendrix-influenced groups since 1973, and enjoyed a fair amount of commercial success in the mid to late 1970s. Bruce and Trower are old friends, a couple of years apart in age -- both are heading into their mid 60s -- and this is not the first time they have collaborated on an album. They made two joint recordings in the early 1980s, including one called BLT, with Robin Trower band drummer Bill Lordan. Now, more than a quarter century later, Bruce and Trower have again teamed up on record, this time with British drummer Gary Husband. Husband is about 25 years their junior, but his resume includes stints with John McLaughlin and Alan Holdsworth, as well as being a member of the pop band Level 42. What makes Seven Moons such a success is that Bruce and Trower each play to their strengths, each evoking their trademark sounds, drawing on the iconic elements of British blues, but not trying to recreate old hits. Both are in fine form -- Bruce's voice has a bit of the cragginess that age brings, but that suits his style perfectly. Trower, if anything, has toned down his style, tending toward the understated, and adhering to the "less is more" philosophy. In fact, most of the album could have been recorded live. About the only audible overdubbing are the lead guitar parts Trower does over his rhythm guitar. Bruce's bass remains as he has always been, solid and tasteful, shunning the instrumental spotlight. Gary Husband's drumming is also subtle reflecting his jazz experience. About the only thing missing is the lyric writing of Pete Brown, who penned words to Bruce's music for Cream that were the epitome of 1960s consciousness. On Seven Moons Bruce and Trower are co-composers, and the songs are a mix of blues with the kind of quasi-philosphical words that could have come the golden days of the genre. Most of the tunes are in minor keys, so even when there is a love song, it still sounds vaguely bluesy or spacey. Jack Bruce and Robin Trower have teamed up again after a hiatus of more than 25 years, to create an outstanding and tasteful album that evokes the British Blues movement that spawned both principal players, while not recycling old material, nor trying consciously to be trendy in any way. It shows its strength through Bruce and Trower doing what they are best at, and coming up with a good collection of worthwhile material. Drummer Gary Husband is an excellent choice to join them, fitting right in with the flow of the music, but still keeping it at a high musical level. Our grade for sound quality is close to an A. The recording and mix are about as relatively understated as the music, without needless studio effects. It's a kind of minimalist recording for a rock album. Little overdubbing is apparent and the instrumental and vocals sounds are well captured. The dynamic range is not great, but rock rarely is rarely subtle in its dynamics. There, I have gone though almost the whole review without describing it as "classic rock." Ironically, there's a little chance that these rock icons will get airplay on the so-called "classic rock" stations, since their music is on an independent label, and more importantly is new and interesting, and well, you know the rest. It goes to show that a couple of guys in their mid 60s can still make some classy rock.